You’re an agent who’s ready to work, make things happen, and do everything you can to help your clients have success. You also happen to be younger than the average agent and some potential clients you’ve met have seen that as a negative thing. Maybe you’ve even missed out on some business because of it. Here are 10 ways to overcome these objections to your age. 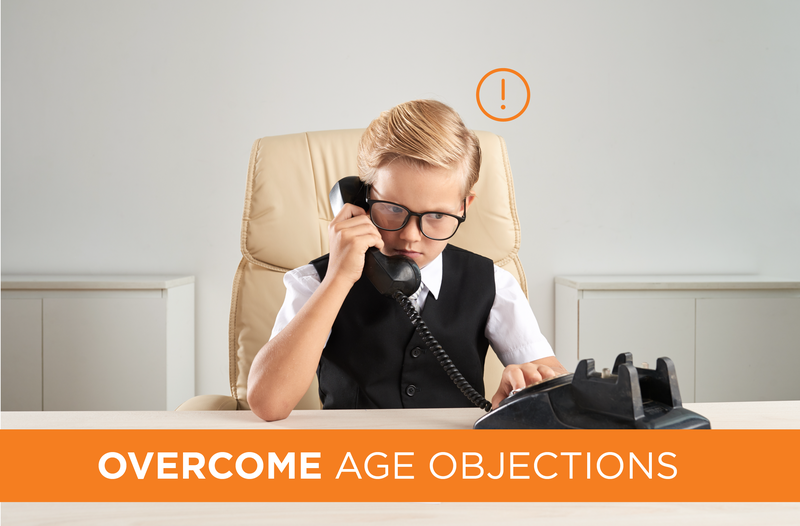 This is the first and biggest thing you can do to overcome age objections. Your age is an asset, not an impediment. Don’t look at it as a negative thing! And most importantly, never apologize for your age. If you’re worried or insecure about it, people will pick up on it. Instead, be confident in your knowledge of the market and in your ability to work hard. Go in with a positive attitude, ready to make things happen and that energy will translate to your potential clients. And at the end of the day, you know more about real estate than your clients do—don’t forget it! You are a professional. A young professional perhaps, but still a well-trained and qualified professional. In fact, you grew up with the internet. This gives you a leg up when it comes to the latest software, apps, and other trends in the industry. Explain that you will be able to use the latest technology to reach more potential buyers or sellers. You can even expand this to include digital marketing, including SEO techniques, Facebook ads, and other social media marketing strategies that will help you sell your client’s home faster. You know how to hustle. You’re eager and determined to make things happen. On top of all that, you’re not stuck in a rut, doing things the same way they’ve been done for the last 20 years. You have fresh ideas and can’t wait to get started. It’s 2017 and Facebook stalking is a real thing. But seriously, many of your potential clients will check your social media profiles before they sign with you. It’s time to give your profiles a professional refresh! Get rid of any pictures of you partying in college or anything else that could give the wrong impression. Also change your profile picture to your headshot. Do you play sports? Sing in a band? Love to travel? Great! I totally recommend having those things on your account still, just make the first impression be professional and put together. There’s no way around it: you have to put in the time. Since you aren’t as experienced as other agents, you need to know your facts. Become familiar with your market and get to know the details about what is happening around you. Spend time everyday doing research. It will pay off! This almost goes without saying. Since you’re going to be younger than a majority of the clients you work with, you’re just making it worse if you are dressed sloppily. Keep your grooming under control and do everything you can to look your best. Invest in some nice professional clothing and look as fresh as you can! Facts are facts: there are other agents who have more experience than you. But don’t let that get you down! Instead, do everything you can to learn. Read books and articles. Study success tips from your industry heroes. Find those real estate professionals you look up to and then attend conferences, watch webinars, and follow their examples. As you know, there are plenty of agents around you who have found the success you’re looking for. Try to connect with one in your area who can show you the ropes. Or maybe join a Facebook group and find an agent from a different part of the country who can answer your questions and give you advice. You’re a millennial, they’re a millennial. It’s a perfect match! One strategy you could try is to market yourself as the agent who knows how to connect with millennials. You understand their pain points, know how to communicate with them, and you will both be on the same page when it comes to technology. It’s a match made in heaven. There are tons of resources out there that can help you be more efficient in your real estate business. One of the key resources you need is a lead generation service like Landvoice. We can connect you with the latest FSBO, expired, pre-foreclosure and other leads every single day. Do your research and find tools that will expand your bandwidth as an agent. Well, there you have it. 10 ways to overcome people’s objections to your age. Try implementing some of these over the next few weeks and let us know in the comments below how it goes!